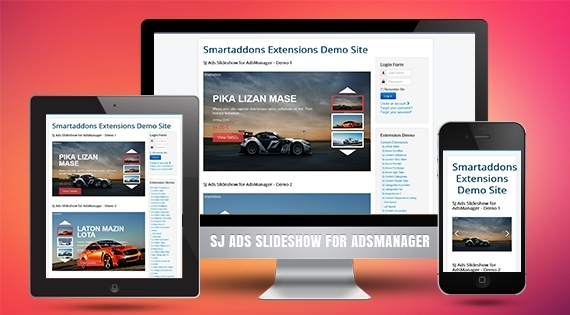 SJ Ads Slideshow for AdsManager powered by clean and clear layout with the best features designed for ads showcasing, supports AdsManager component, Joomla 3.x. Wanna have an impressive advertising campaign? This module will help you. Take a look at demonstration, you'll feel excited about the professional arrangement of item's details include large images, title, description, price and readmore link within a single area in no time. You can also make your own choice to display or hide the thumbnail with navigation button used to help users catch the overview of ferring items. By using mouseclick into thumbnail images, items' description appear smoothly with support of many nice effects include both simple and professional ones for displaying items on your frontpage. Along with responsive layout, this module can fit all device screen sizes. You can either display price detail for websites selling products and other types of webpage. Furthermore, friendly user interface in Admin panel is totally easy for you to control every parameter we provide. You can decide the number of items to show on frontpage, add suitable categories, which slide effects you prefer and etc. Based on your configuration in this important area, your website will perform as exactly as you want. Refer to the photos we captured and specified below to see how it works. Now, let's click View Demo button to see its best performance! 3. Support 2 layouts. You can see the screenshots below.